When we think of balance, especially in dance, our mind goes to moments when balancing is a challenge – perhaps standing en relevé or maintaining a pose on one leg. But our everyday movements, like walking, require this ability to balance as well. We are making constant adjustments, using our senses and our muscles, as we stand, shift, change, and move our bodies through space. This is balancing, something we’ve been gradually learning to master since we were babies. Because it’s relevé, arabesque, or the tilt you teacher put in your contemporary dance that may be giving you trouble, I’m going to give some tips and thoughts to improve your overall balancing of poses. But just like when you were little, learning to balance is very much about trial and error. Each time you explore, challenge yourself, try and fail, and try again, your body is learning how to better balance itself. 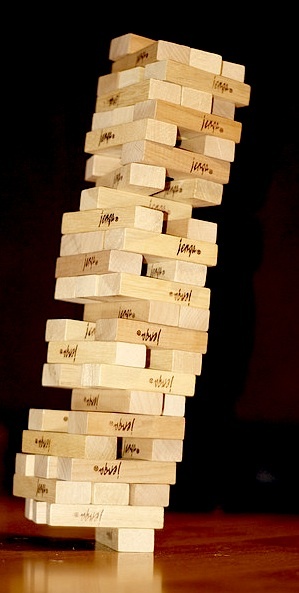 When building a vertical tower of blocks, the tower is most stable when each block is stacked directly on top of the one below it. This is true when balancing your body in a vertical position as well. In dance, this stacking of the body may be referred to as, or considered part of the concept of alignment. The ankles are stacked directly over your base of support, the knees over the ankles, the hips and pelvis over the knees, rib cage over the hips, the shoulders over the rib cage, the head and neck topping off the tower. When something is out of place, it is still possible to maintain a pose but it may not be as stable or healthy for the bones and muscles that must work to support the position. When one thing is out of place, something else must counterbalance the misaligned body part. A common example is allowing the rib cage to “open” or jut forward when standing en relevé. With your rib cage displaced in this way, you will likely need to shift the shoulders back, or tilt the pelvis (creating a swayed back), or both in order to balance. I won’t go into all the possible or common alignment corrections right now – each body part could have its own post. Your teacher is in the best position to help you individually. Having a good working knowledge of how the body should be aligned is a gigantic part of maintaining a solid vertical balance. Strength and stability (or lack of these) in supporting muscles and joints can also affect your ability to balance. In relevé you may notice that your ‘ankles’ (actually it is the tarsus joint) are wobbly. The tendency is for dancers to supinate or roll toward their smallest toe (also called sickling) when in relevé. The body will try to correct and overcorrect looking for a stable alignment over the second or third toe. Someone with superior balancing ability makes these adjustments but they are much smaller, maybe even imperceptible. With weak or tired supporting muscles you will have larger adjustments to make and will wobble over your base of support. Strengthening the muscles that allow for this side-to-side movement of the foot (supination and pronation) will give you more stability. There are many exercises that help with strength and control in this area but the most straightforward is practicing sets of relevé, first in a slow, smooth manner so that you can detect any of this sideways motion as you rise. The goal would be to rise each time with your weight directly over the second and third toe without supinating or pronating on the way up or down. Doing this under the watch of a trained eye (your teacher) will serve you best. The muscles of the foot, ankle and lower leg are not the only muscles which support proper alignment of the body. In maintaining balance, an engaged and strong core (or center) – muscles of the torso (abdominals and back)- also play a key role in good balance. As in our earlier example, these muscles help to keep the shoulders over the ribs and hips, the rib cage in alignment over the hips, and the pelvis aligned. They also keep the torso from ‘sinking’ into the hips and legs. Strengthening and learning to stabilize the core can be approached different ways. Your teacher is a great resource. You may Pilates or other exercises focused on the core but my best tip is to become a mindful dancer while you are in class – work to maintain proper alignment at all times, listen and apply corrections and you will gradually build awareness and strength that will help you with balancing (and lots of other things too). We’ve talked about the structure of a balance and constructing a balance from ground up but. though you are maintaining a pose, there is constant motion involved (even when you reach the point of “stillness”). Also it may be easy to think of classical poses as a tall tower, but what about more contemporary, off-center, balances? This is where I find the concept of growing a balance helpful. Preparing for and getting into the balance is as important what happens once you are there. Whatever your preparation is – a plie, a shift of weight, a first position – maintain correct alignment with a strong connection or relationship to the floor. In these moments you are creating quality soil for planting your pose. From this preparation, you’ll find it more natural to then grow from the ground up. In a simple relevé, for example, you’ll begin in a good first position with weight evenly distributed in the feet. The rise begins with your push from the floor and grows through your ankles, legs, pelvis, torso, neck and head but, it doesn’t stop there. You continue lengthening and growing as your roots go deeper. The idea is the same whether your pose is a classical arabesque, a contemporary tilt, or a handstand. They all grow from the soil and branch upward and outward. Your ability to balance can be greatly affected by how and what you think or imagine. When balancing, you might be thinking really hard about holding yourself UP but actually DOWN is a pretty useful direction. As you rise to relevé or move into the position of your intended balance, think of pushing the floor away from you. Imagine roots embedding themselves deep into the ground while your branches (head, neck, and limbs) grow up or outward. Sometimes dancers have the tendency to look down, even when they balance. I tell my students, “Keep your eyes on the floor and that’s where you’re likely to end up.” If you are a beginner, it may help to remember to keep your eyes lifted and focus outward. Imagine that you have x-ray vision and can look beyond the walls of your studio. This outward focus can be a big help but remember that you can’t rely totally on vision for your balance. Dancers sometimes depend on it way too much. If you practice balancing only with a mirror in a well-lit room, you’ll find that balancing is much different and probably more difficult on stage. If you are a growing teen, you may suddenly find you are struggling with balances that were once easy. Sudden growth spurts can create a drastic change in your center of balance and also affect your ability to lift or extend longer limbs. I once had a 12-year-old dancer who had gotten really strong over the course of a year – her balances were stable, she was able to extend and hold her leg above 90 degrees, her movements were coordinated. Over summer break, she grew three or four inches and came back to class with longer everything – legs, torso, arms – and in many ways, it felt and looked like she was starting from scratch. If this is you, don’t get discouraged, keep working, practicing, and experimenting and you’ll soon learn to control your new body. Stand on one leg and slowly move your torso, head, and arms in any or all directions – try symmetrical movements first, and then asymmetrical. Test and challenge your balance. Can you pick up the pace? Move and improvise to a piece of music. Don’t think of choreography but imagine that you are trying to touch every molecule around you with every part of your body and explore every inch of the room. Have a friend randomly pause the music (or you might use this Freeze Dance iPhone App if you’re alone). When the music stops, challenge yourself to freeze and balance in whatever position you’re in. Try the first exercise again but don’t just balance on your feet. Try “gluing” one or two body parts to the floor instead: a hand and a foot, your bottom, your knee, your shoulder and head. Experiment with moving and finding moments of balance this way. An article called Dancing from the Centre, talks about this sometimes confusing term and offers several tips for “finding” your center. This bit that gives some insight about what a teacher usually means when he/she talks of the centre. I have discovered there are several terms used to talk about this mysterious ‘centre’. Amongst them are: ‘the core’, ‘centre of gravity’ and ‘centre of weight’. When teachers talk about ‘the core’ or ‘the centre’ it has been my finding that they are after an engagement of the abdominal muscles in their students; a muscular engagement that is evidenced both visually and aesthetically in their students’ dancing. But what exactly does it mean to engage your abdominals? I’ve used the phrase many times with my own students only to receive blank stares, so let’s talk about it. Deborah Vogel from The Body Series explains that when you engage the core (or “pull up” another way you might be asked to engage your abdominals in class), your abdominals contract isometrically. This means that rather than a shortening or lengthening contraction of the muscles, the muscles contract but stay the same length. Like Deb, I use the idea of “lacing up” the abdominals with my own students because it is an image that clicked for me the first time I heard it. Go ahead, try this image now… Really imagine it, use your minds eye to feel the laces crossed over your torso and slowly cinch them inward (not too tight, you should be able to breathe), bringing the abdomen and organs closer to your spine which runs down the center of your body. It may take some practice but eventually this activation of the muscles can become second nature. 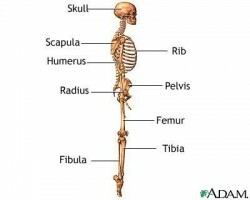 By the way, Deborah has some other great resources at her site – check out the Core Stability DVD, and Deborah’s Dancing Smart ebook for more exercises, technique and tips. The abdominal muscles are very important in dance. More than just the abdominal muscles is involved in truly strengthening “the core” for dance though. A brief description of the muscle groups (left) that, from an anatomical perspective, form the core can be found here. All of these muscles must be strengthened to enhance your dance technique. Special equipment is not necessarily required, but an understanding of how the body works is key to working more intelligently while you’re in class. The regular use of these muscles during your dance practice should strengthen and train these muscles. But it doesn’t hurt to work outside of class on this very important muscle group. Practice engaging your abdominals as you do daily activities to strengthen and form a habit of supporting movement using your core. Then you can focus on other things as you dance. Try these suggestions from Dianne at Ballet Shoes and Pointe Shoes for core exercise. Make sure your retiré position is properly turned-out and aligned as you do this work (have a teacher check it out if you’re not sure). Condition with Pilates. The focus of this method is very much on the core which is why you’ll find dancers of all levels in Pilates classes. Why is engaging my center or core so important? What’s the big deal about this magical part of the body? Why is it so important to my dancing? The answer is freedom. Freedom in the arms and legs, the spine, and torso is created when a dancer has control of the space where all of these extremities attach – the center of the body. Freedom comes from strengthening, engaging, and stabilizing the core.